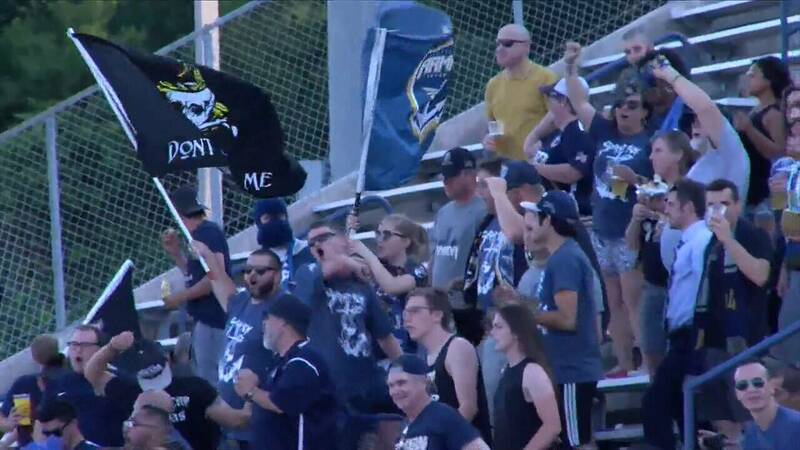 JACKSONVILLE, Fla. - Armada FC head coach Mark Lowry said all week leading up to the first ever playoff match for his team that they were better than Miami United, despite not coming up with a win in three previous meetings this season. On Wednesday night, he was right. In front of more than 2,000 fans in attendance, it was midfielder J.C. Banks starting things off for the Armada. In just the 8th minute, he controlled a cross from Josh Castellanos and put it past the Miami United keeper for the early 1-0 lead. Miami would even the match at 1, leaving both teams level as they went to the locker rooms at the half. "I changed my tone with them a little bit," said Lowry on the field after the match. "I demanded more of them and you saw there was a clear response in the second half." It only took 98 seconds into the second half for that response as Banks created his second goal of the match, a deflection off of Miami defender Pierre that was ruled an own goal. That gave the Armada a 2-1 lead. "I thought it was a good team performance," said Banks. "We finally scored some goals against these guys. We struggled to do that the past couple of games against them so it was nice to get off to that early start." Just 68 seconds after that, it was Banks again creating for the Armada. This time with an assist to Ciaran Kilduff, who scored for the 6th time in the last 7 games. Kilduff would add another in the 74th minute to make it 4-1 Armada, which was the final score. Next up for Jacksonville is Miami FC 2 who finished at the top of the NPSL Sunshine Conference this season. That match is Saturday in Miami.